For a long time I wanted to buy a carrying system for my camera, but one thing I didn't like at all: I didn't want to have to screw another adapter plate to the camera every time I changed from tripod to carrying system or vice versa. Now I found a suitable solution without having to screw it on and off. With this solution, you use an adapter plate permanently screwed to the camera for both the mounting in the tripod head and for the carrying system. Time-consuming and annoying retooling is no longer necessary. I shoot almost 40% of my photos with a tripod. Especially with HDR and long exposures there is no other way. For this reason, an adapter plate is permanently screwed under my Nikon D500, which allows a quick attachment to the tripod head. Depending on which tripod I use, I either have to change to the adapter plate of my travel tripod or to the one of my heavy Cullmann Magnesite tripod. Already these two variants annoy me. Mounting the different plates takes time, is fiddly in the cold and I simply can't act fast enough. Most camera carrying systems come with their own adapter plate, which is used to attach the camera to a strap, belt or strap. That would be the third different adapter plate in my photo backpack. If I imagine that during a nightly walk at the marina in Abu Dhabi I would first have to unscrew the adapter plate of my carrying system in order to then screw on the adapter plate of my travel tripod, it shudders at me. I wanted to install an adapter plate on my camera, which I can then clamp in the carrying system and both tripods without having to change anything. Which adapter plate fits both in a tripod head and in a good carrying system? What I was looking for was a standardized adapter plate. So I searched for "Adapter plate tripod camera norm" at Google. This way I came across a standardized format called "ARCA" or "ARCA Swiss" for the first time. 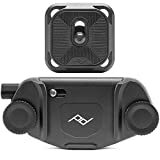 I then searched for these two names at Amazon and found a suitable storage system, which uses exactly this kind of adapter plates: The "Peak Design Capture Clip v3" is a carrying system for attaching the camera to belts or rucksack straps and promises a quick mounting and dismounting of the camera. Mount the camera on the tripod despite the carrying system adapter plate. 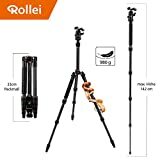 As a travel tripod I use the "Rollei Compact Traveler No. 1 Carbon" because it is very compact and lightweight to stow on air travel. Due to its low weight, it is also suitable for carrying on belts or backpacks, even on longer hikes. The stability of the tripod is still sufficient for me, only with strong wind the tripod comes to its limits. Acuh in terms of arca compatibility I was lucky with the "Rollei Compact Traveler No. 1 Carbon". 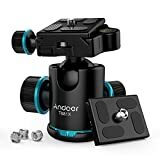 Actually, I was already looking for an alternative tripod head for the travel tripod, but when I looked at this again in detail at Amazon, a feature of my tripod on the Amazon product page caught my eye. Rollei writes that the "[...]360° magnesium panorama ball head with camera quick-change plate (Arca Swiss compatible)[...] is. Bingo. At the latest now I knew that I was on the right track. Now the question remained, how to get my big, heavy "Cullmann MAGNESIT 525M CW25" compatible to the ARCA adapter plate. The 3-way tripod head mounted on the Cullmann was not very reliable anyway, as the screws often loosened by themselves and I would like a ball head much better because of the smaller packing dimensions. So I started looking for an ARCA compatible ball head. I came across the "Andoer TB81X Stativ Kugelkopf" and ordered it for testing. After receiving the "Andoer TB81X" I noticed soberingly that the supplied adapter plate of the "Rollei Compact Traveler No. 1 Carbon" fitted into the "Andoer TB81X", but not the other way round. The adapter plate of the "Andoer TB81X" is not square, but slightly elongated, which is why the inclusion in the travel tripod is not possible. No problem, as long as you always carry the square adapter plate of the travel tripod on the camera. This doesn't harm the secure hold of the camera in the tripod head. A few days later I received my "Peak Design Capture Clip v3" and unpacked it. I attached the supplied adapter plate to my Nikon D500 and even before I tested the carrying system, I had to find out if this adapter plate really fits into all tripod heads. The result pleased me, because now it was possible for me to snap the camera into the carrying system after remaining or to set it into one of my two tripods, completely without the conversion of the adapter plate. Ingenious.